Flowers bring life to weddings and set the tone for the whole event. Choosing the perfect blooms to match your wedding colors and style takes careful consideration. Wedding season is here and our florists all over the country have been working hard to make bride’s visions come to life. Browse through some of our florists latest designs to find bridal bouquet inspiration. This soft light blue and white bouquet was designed by Yacht Flowers in Fort Lauderdale, FL. This bright peach and green bouquet was designed by Flowers of Worth Avenue in Palm Beach, FL. This stunning bouquet of deep lavender, red and light pink was designed by Ann’s Petals in Longview, TX. This colorful orange and light pink bouquet was designed by A Fruit Basket Southern Blossom Florist in Charlotte, NC. This whimsical purple and white bouquet was designed by An English Garden Flowers & Gifts in Mokena, IL. Flowers have become a way for brides and floral designers to display their creativity. Talk to your florist about exactly what you would like to see in your wedding bouquet and watch your vision come to life. 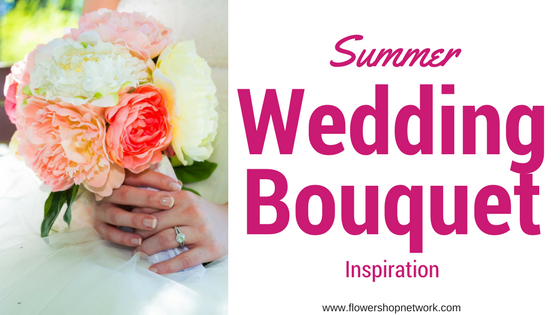 If you want to continue to browse through wedding bouquet ideas visit our Wedding and Party Network Photo Gallery where you’ll find more beautiful arrangements from local florists all over the country. Want to make your bouquet that catches the eye? A colorful bouquet really stands out against the ivory color of a wedding dress or a neutral colored bridesmaid dress. Here are some colorful bouquet ideas for your upcoming special day! Combine bright oranges and yellows for a poppin’ bouquet! Add small pieces of greens, like a beautiful succulent or dusty miller to complete your bouquet look. Green bouquets are growing in popularity and bright greens can really make your arrangement stand out! Add white roses or a touch of lilac throughout the arrangement to give it that ‘just picked’ garden look! Don’t hesitate to use different shades of a favorite color. Combine fuchsia, magenta, pink, and tangerine roses for a bouquet that will grab everyone’s attention. Add a couple of succulents for a rustic look! Get creative with your florist for a unique wedding bouquet! For more great ideas, visit the Wedding and Party Network Blog! As florists everywhere are preparing for the busy bridal season just around the corner, we wanted to share some beautiful bouquet inspiration from Instagram. We love the variety of florals found on this popular photo-sharing site and just had to show you what talented florists from all over the world are creating for some very lucky brides. Take a look at the delicate color and incredible attention to detail evident in every photo. We think you’ll agree – nothing is sweeter than those soft pinks and vintage whites which offer up a classic look and a timeless feel in any design. Know that experienced florists have the skills and artistry to take your breathe away on special occasions like your wedding day! Every Tuesday, we share inspiring flowers and exciting trends from amazing real local florists active on Pinterest & Instagram! Hey FSN Florists! Want your Instagram photos to be featured on our blog? Add your Instagram info in fsnF2F.com. Just use ‘Edit Social Media’ under the Marketing section of the orange side bar. It seems that wedding bouquet fashions often change with the seasons. Certainly, fashionable bridal bouquets just a decade ago can seem dated and old-fashioned by today’s standards. It is fun to look at pictures from your parents’ or even your grandparents’ wedding and see the bridal bouquets that were in style then. Some of those bouquets were awfully big! If you’re planning a wedding, or even just dreaming about planning a wedding someday, we hope that you’ll find these bridal bouquet pictures helpful, and perhaps inspirational. These beautiful wedding flower pictures are brought to you courtesy of a local florist near you. Planning a dream wedding? Pictures are a great way to see just what lovely flowers are commonly used in weddings. Once a wedding date is finalized, contact a professional florist to schedule a wedding consultation. These styles have been popular for several generations and will continue to be ideal for traditional elegance. Gathering of creamy-white roses, stock and wax flower hand-tied in a round, colonial bouquet. Lush ivory rose bridal bouquet lightly-sprinkled with seeded eucalyptus for soft, romantic look. White lacy blossoms of alstroemeria and wax flower perfect for bridal, as well as bridesmaid bouquets. Color – a hot trend in bridal bouquets with pink roses, orange-yellow tulips, yellow mini carnations, lavender aster and purple statice. Graceful, white cascade bouquet in roses, dendrobium orchids, gerbera daisies and wax flower. A simply elegant favorite, calla lily wedding bouquet, hand-tied in a presentation style. Below you will find more modern wedding bouquet styles florists are creating today. We hope this gives you even more inspiration as you plan your wedding day flowers.